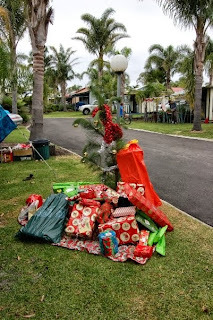 I have just finished reading, Judy's blog Our family Christmas Now and Then, which gives an Australian perspective on Christmas Traditions Down Under. This blog has come about as a response to Pauleen's invitation, 'Family History Across the Seas', to take part in the 2012 Christmas GeneaMeme by describing how we celebrate Christmas in our part of the world. What a great way to share the customs of Christmas. I recently posted on "Family Recipe Friday - Family Christmas Cake", one of my favorite Christmas Customs. At the time I thought it would be good to share some other family christmas traditions, so this gives me a great opportunity to share some of our other traditions. I think our traditions change over time, some old ones get forgotten but often new ones come along. We have a "new tradition" that started about 5 years ago. Following a family trip to the Zoo with my son, his wife, her parents and my nephew and his family I made up a Christmas Calendar for everyone for Christmas. This has now become a annual family event in late November, which we plan about 6 months ahead, picking a fun venue, who ever is available comes along for a family day together. I get to take lots of photos (which I love doing) and I put them in to our annual Calendar to be given as gifts on Christmas Day. (sorts part of my Christmas shopping as well). This year we went to Luna Park on Sydney Harbour, great day was had by all, big kids and little kids. Church was a big part of our christmas celebrations when I was a child, however it does not play such an important part nowdays. Of course!!! Isn't he real?? It is not general that groups go carolling in Australia however, in the town that my son lives in the local Fire Engine truck drives around with Christmas Carols over the loud speaker and they throw lollies to the children as they drive by. I like all Christmas music, love the music from "Love Actually". I have a few but "Away in a Manger" does bring back memories of going to church on Christmas Eve with my Nanna. We generally do individual gifts. Sometimes we will all put in to buy something special for my Mum. 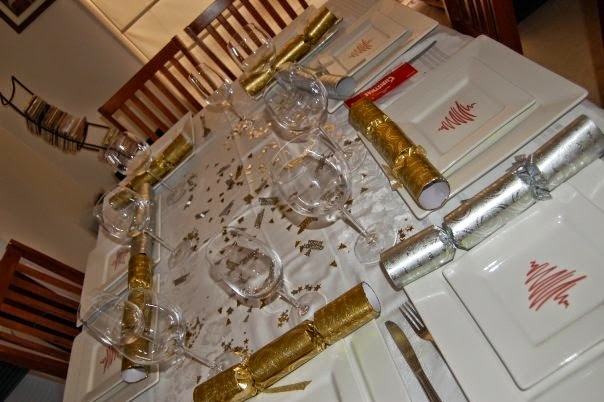 ﻿ Is your main Christmas meal indoors or outdoors, at home or away? This depends on where we are for Christmas. When we lived in Port MacQuarie (on the coast) we did have a couple of Christmas Lunches at the beach. This year we having indoors. What is Christmas without a pudding!!! Often when it is time to have the pudding we are all to full and it is put aside to have later in the evening. Seafood is an important part of our meal, with the usual Ham, Turkey or Chicken. Yes, I used to make biscuits as gifts, however these days I don't seem to have time. We try to find a venue that suits the majority of the family. Not a lot of difference, though I think today there are more presents. There are generally a number of pre-christmas parties, barbeque's etc. We have a single strand of solar powered lights on our balcony (which has actually stayed there for the whole year). Nothing like being prepared. Not in our area, but there are some suburbs in Sydney that go "all out" with the lights. When I was little we used to have singalongs around my Nanna's piano, but this doesn't happen now. Have any of your Christmases been spent camping (unlikely for our northern-hemisphere friends)? We have spent a couple of Christmas's in Caravan Parks, fun now and then but not my favorite venue. Usually at our home or a family member's home. Not likely to happen in Australia. Do you have a Christmas tree every year? Yes. Is your Christmas tree a live tree (potted/harvested) or an imitation? Imitation. Do you have special Xmas tree decorations? Yes I do have some special ones that have been given to me, and some others that represent special Christmas in the past. I also started a tradition when my first grand child was born. Each year around the first weekend in December I send my two grandchildren a Christmas tree decoration for their tree. Which is more important to your family, Christmas or Thanksgiving? We do not celebrate Thanksgiving in Australia. Diane, thanks for sharing your stories - and I love the photo of the Christmas tree when you were camping! Diane, what wonderful traditions you've developed. I especially love the special November outing (though with a teacher in the family that may tip her sanity scale) and the annual tree decoration. I may have to pinch these great ideas! I'm glad to have found someone who's been camping a bit at Xmas - not that I have -but I was starting to wonder if the Aussie camping Xmas was a figment of my imagination. Love the camping Xmas tree. Thanks so much for sharing -sorry to have been late getting to my responses -as you'll see from my blog post yesterday we had a scary week this week but have had a BIG Xmas present.